Our next major photopost will be for tomorrow’s feast of Candlemas; please send your photos of the blessing of candles, the procession and the Mass to photopost@newliturgicalmovement.org for inclusion. 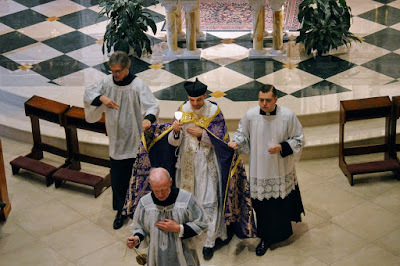 As always, we will be very glad to receive photographs of celebrations in either Form of the Roman Rite, any of the Eastern rites, the Ordinariate Use, etc. We will also include photos of the blessing of throats in honor of St Blase, whether it is done on the feast itself, or anticipated on February 2nd. Please be sure to include the name and location of the church, and always feel free to add any other information you think important. Evangelize through beauty! From our first Candlemas photopost of last year, the faithful holding candles during the Canon of the Mass at Santissima Trinità dei Pellegrini, the FSSP parish in Rome. From the second post, the procession at Holy Name of Jesus in Brooklyn, New York.